One glance at the key things to do in Umbria reveals the truth: it’s all about the food, the flavours, the character of the place. Amid poplar trees, wide lawns, forests, myths, legends and more it is the food in Umbria that binds the region together. Make way Tuscany. Umbria’s time is here. What a difference a C makes…Cumbria is a wild, wet and wellie-wearing region in the north of England, whose damp hedgerows and fields of daffodils fired the literary imagination of Wordsworth several times over. Let me clear up any misunderstandings here and now by introducing you to the region of Umbria, Tuscany’s neighbour and overshadowed little sister. Umbria is the Mary to Anne Boleyn, the Dannii to Kylie Minogue, the Robert F. to JFK. 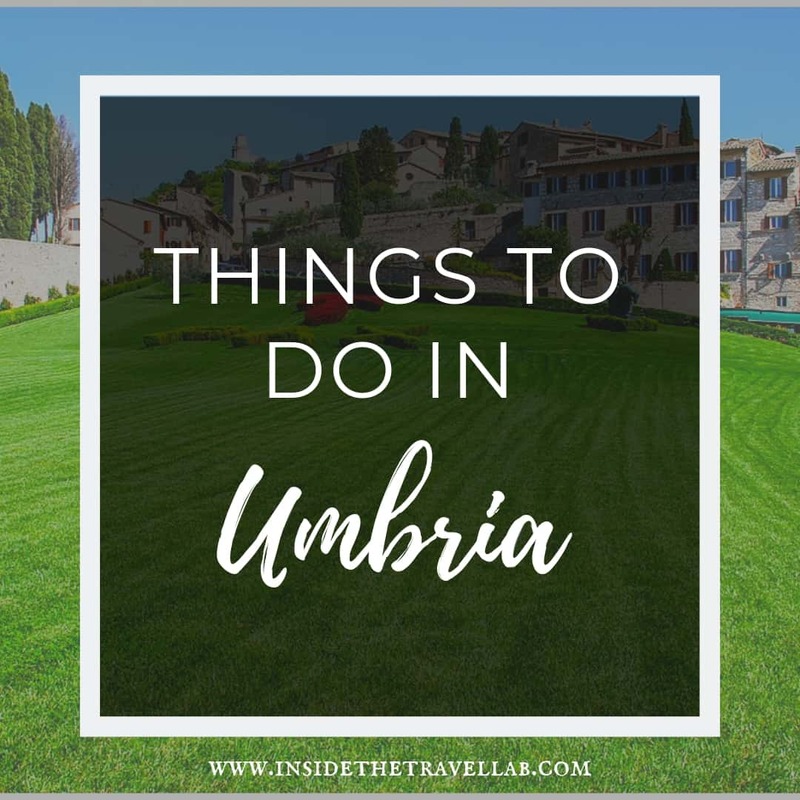 Whatever you may believe about those names, Umbria certainly doesn’t deserve its place in the shadows. Yes, it’s that Assisi. Home to St Francis and the animals. Assisi is a popular destination for pilgrims in Italy, making it one of the most visited cities in Umbria. But Francis isn’t the only saint in town. Assisi also calls Santa Chiara (Saint Clare) her own. But as beautiful as the religious grandeur is, for me the highlight involved escaping to nearby Mount Subiaso and learning all about Italy’s Slow Food Movement. Lake Trasimeno, Italy’s 4th largest lake, snuggles right in to the green hills of Umbria. Its banks sprout picturesque villages, from Castel Rigone to Tuoro sul Trasimeno, San Feliciano to Passignano sul Trasimeno and even Castiglione del Lago. Cultural sites you can visit in this region include the ruins of the Tower of the Roman era and Guglielmi Castle. Typical foods to try near Trasimeno Lake include roasted goose and fried perch fillets. If you love seafood, you need to try out the carpa in porchetta, a delicious meal consisting of bacon, fennel and carp baked in aromatic spices. Perugia swims with artistic and historical treasures on steep stony steps, spilling its secrets slowly. Yet for all the pretty postcard streets, this is a town with a pulse and panache and that’s largely thanks to its university. Founded by Pope Clement V in 1308, today it is the biggest university for foreigners in the whole of Italy. Key monuments include Corso Vannucci, the Oratory of San Bernardino, the Etruscan Well (Pozzo Etrusco), and the National Gallery. Orvieto is one of the most ancient cities in Italy, with strong Etruscan roots, a sacking by Rome and a touch of renaissance following the Middle Ages. Perched dramatically on a rust red volcanic clifftop, its Duomo di Orvieto isn’t shy, with zebra-like columns and mosaics and frescoes aplenty. Other key landmarks include the Chiesa di Sant’Andrea, Museo Claudio Faina e Civico and Torre del Moro. The lovely hamlet of Narni oozes with cobbled stone mystique. Located in the province of Terni, its subterranean world includes a 13th century Benedictine church, Roman aqueduct, the Holy Inquisition and a prison cell. Above land, check out the Duomo of San Giovenale and Ponte Cardona. Once in the city, make sure you try the local pasta manfrigoli served with guanciale, fava beans and pecorino cheese. Spoleto is a popular and important historical town dating back to Roman times. The town has numerous monuments, including several important churches and a cathedral, an imposing fortress and roman theatre. Spoleto’s dishes are mainly based on meat and land products. Delicacies to try while in this town include Bruschette, strozzapreti (umbricelli), Torta al testo, Palomba alla ghiotta and Castelluccio di Norcia lentil soup among others. When it comes to Perugia’s culinary scene, this town is known for chocolates. That is not all. Delicacies are made using raw ingredients linked to centuries-old peasant traditions. Foods you should try on your next visit to Perugia include truffles, Pecorino & Caciotta cheeses, Prosciutto di Norcia, Porchetta and Salsiccia Secca (Dried Sausage), just to mention a few. Disclosure: I travelled to Umbria as a speaker with TBU. All words, photos, opinions and daffodils remain my own. I was so sorry to miss TBU this time but looking forward to all your posts. I’m still discovering it bit by tiny little bit. No complaints though – so much to see! I love the depth and romance of your photos! I was also so sad to miss TBU and can’t wait for your posts! Thank you! Yep, it’s a shame we can’t make everything that’s going on all the time! Beautiful! I really enjoy the photo of Assisi, and that last shot is great. I think the first one’s my favourite but I also love those candles! Great Post! You really captured the essence of beautiful Umbria in words and photos! Hmm. I’m not so sure now! I think it needs even more photos of food! The Mary to Anne Boleyn.. Lol sold! I’ve always wanted to visit the C-less Cumbria. ;) your photos just made me want to go even more. I would definitely say it is a bit different than England lol! This place looks wonderful. What a cute getaway! And I completely agree with you about Umbria. Less known than its closer sister Tuscany, and for this reason more wild, in the sense of keeping its original atmosphere. Funny that you picked up on the Cumbria/Umbria thing as well. Whenever I told anyone where I was going for the week the usual inquisitive reply was Cumbria? Umbria blew me away with its beauty, the rolling green fields with small towns perched on hillsides. Thanks so much for these wonderful photos…you really captured both the majestic and humble sides of this unforgettable region! You are very welcome. Thank you for the invitation to see this part of the world. More to follow!